Get back to us if and when this actually happens. At least you admit that there is a mess to clean up. BTW, "The state had said cleaning up the Capitol following the protests would cost $7.5 million, but then backed down from that number and said Friday it may only cost $350,000." 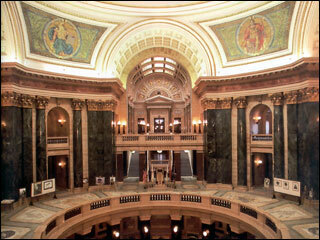 The WI Capital is a beautful building, I hope the damage can be repaired. is every surface made of marble? Every wall? Stop lying, the Tea Party members offered to do it for free to save the already broke state of WI the money would it cost them if they paid people to clean up the liberal retard mess that was left. trash? How about historical memorabilia? leave it to liberals to make trash a historical menorabilia! !